Take out life and limb. That war still rages in his head. As he silently fights to be understood. It was only by God's Grace any survived. They say they would do it again. 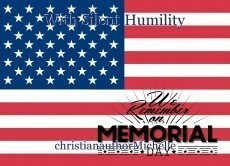 © Copyright 2019 christianauthorMichelle. All rights reserved. Powerfully penned write; may we never forget why we have Memorial Day! Thank you for remembering the REAL reason! This page was created in 1.1962 seconds.